Cool picture and great observations, Bryce! It preserves some good ancient traditions. The depiction of God in the Garden has him wearing gold-colored robes, which represents a very ancient belief. The ancient Near Eastern peoples generally saw the gods as wearing gold and even having gold-colored skin (which I assume was their approximation of the gods’ brilliant appearance). An interesting scene. To expand on your note, I think the walls are intended to convey the sacred space concept because trees, vegetation and animals continue outside of them. Its interesting that the artist recognizes a garden can become a sacred space. Surrounding it with waters, obviously more than rivers or lake, leaves an island-like image that intentionally or otherwise conveys the idea of this being the crowning act of creation. I think the being with Adam and Eve is meant to be Christ. The figure above is watching, approvingly. The rays emanating from him show that he is there. So I see it as two gods, indistinguishable from each other. Not sure what the red and blue (royalty?) color of the coverings held, and worn, by the angels and the gods might mean. But they succeed in conveying the concept that the two deities and the two angels are engaged in the same Work and are now bestowing upon the first man and first woman the same role. It would be interesting to know more about the artist’s background, life etc. and any record of responses to this painting. Did he paint others? Thanks for your work! It’s greatly appreciated. Very interesting. I was also wondering what instrument the other angel on the top left was holding. Thanks for your work. One other thought: The constellations are clearly represented as creations of God. John Platt has done some excellent work showing that the constellations were a much older system of understanding (i.e. written about in the apocraphal Book of Enoch) that beautifully describe the mission of the Savior. This link gives further insight. 1. Jehovah’s robe/cloak is being wrapped around Adam and Eve. a. A cloak (meiyl Strongs 4596) is named for the act of covering (ma’al 4603 ), which also means ‘a transgression’ : thus Christ/Jehovah covers A&E before AND after their transgression: an eternal atonement (kaphar 3722 also means covering – as well as a WALLED village and a young lion) which is here being associated with marriage. b. Hebrew sometimes uses the same word for cloak/skirt/garment and wing (kanaph 3671) : taking someone under your cloak or wing meant to take them into your tent or household, to offer them protection, and/or marriage / covenant : this may be the context of Ruth covering herself with Boaz’s skirt(also kanaph) requesting marriage (Ruth 3: 7–9). c. Having Jehovah/Christ under the same cloak may indicate that marriage involves three persons, husband, wife and the LORD. 2. The robe is blue, red and gold, the colors of the temple veil. a. Since some see the veil as the mortal/physical body of Christ (passing thru the veil is then putting on or taking off that physical body : see Margaret Barker for this), this may depict the incarnation of both Adam and Eve AND Jehovah as Jesus. Note, then, marriage as a major purpose of this incarnation. Two CHERUBIM with wings are involved. Cherubim are woven into the veil and are upon the Ark of the Covenant in the Holy of Holies. Note that the Cherubim are on the FAR side of the veil, on the side the Father is on? Jehovah is depicted on the NEAR side with humans having condescended. b. The red, blue and gold of the cloak suggests royalty/priesthood. 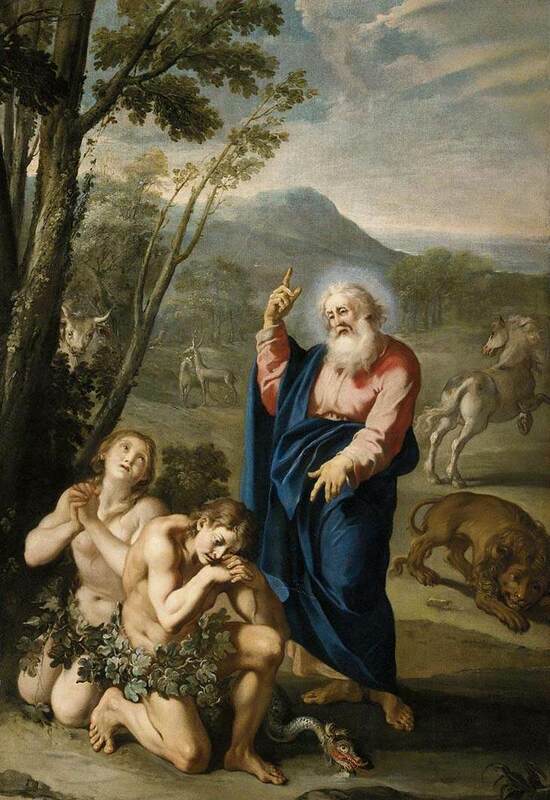 Adam and Eve will later be clothed in a coat by Jehovah (Gen 3:21). The specific Hebrew word for this coat is ketonet 3801, the same garment given to Joseph (Gen 37:3), the Aaronic High Priest (Lev 8:7), and various OT kings and princesses. Is marriage thus being associated with being made kings/queens and priests? Wow, those are some great insights Rebecca. Thank you for sharing them! Bryce, This illuminati is fantastic! Thank you for finding it and sharing it. In my earlier days, I was an Art History major. I particularly have a passion for symbolism in art, so I may be able to contribute a few things of interest. According to the Catholic Encylopedia, http://www.newadvent.org/cathen/06161b.htm – Fouquet is considered the master of 15th Century French Renaissance Art. Not a lot of detail remains of his personal life. However, he was very famous throughout Europe during his lifetime and studied in Italy. Much of his work was lost for centuries, and only recently are works being discovered and preserved. This particular print is from a book of twelve illustrated Bible scenes. So far, I have found one formal critique of this illustration. It is in French. I will have my husband translate it for us, and let you know any observations of interest. Fouquet was the inventer of the art of “miniature” portraiture. His attention to fine detail and realism was marvelous. He loved bright colors and gold leafing. His particular techniques for overlay is a lost art now. Due to his paintings, historians have culled thousands of small details regarding the landscape and daily life of his time period. That said, he obviously was well aware of religious symbolism. The “Adam and Eve” print is stunning in it’s detail and symbolism . When you imagine all of this was placed upon a small page in a book no larger than 8×11, it is even more admirable! This is also important to keep in mind during analysis. Every detail that the painter chose to include would have taken careful planning. He was not just trying to “fill space” – as the space was precious. That means that each detail has particular symbolism and was considered VERY important to his story telling. I would be particularly interested in reading the text below the photo – however it has been cut off in the photoscan. I have yet to be able to find a shot of the whole page anywhere online. It looks like it may include both French, and Latin. The fountain being placed so centrally near Adam, Eve and Christ readily appears as a symbol of life – or, the “fountain of life”. It certainly reminds viewers of the command God gave them to multiply and replenish the earth – with all life beginning in the garden. 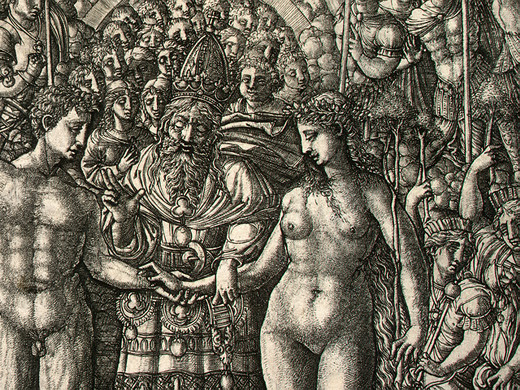 The central story being told in this illustration is the ceremonial joining of Adam and Eve. Thus, choosing the place the fountain in the center of the ceremony suggests that the water was a part of the ceremony itself. I am particularly intrigued with the rainbow (power) emanating from God, which includes six interesting pictorial symbols within. My theory is that the symbols in the arch above Adam & Eve are representative of the gifts and commands that God is bestowing upon Adam & Eve during the ceremony. The two symbols highest or closest to God are a lobster, and a mortal man. Thus, the lobster overhead in this pictograph is a symbol of the importance that GAINING EXPERIENCE will be from the mortal life in which Adam and Eve are now embarking upon together. The lion, the bull, and the sun are popular symbols of life and resurrection. (lots could be written here on these) The deer, or lamb, are symbols of fertility and of Christ. If it is a lamb, it is also a symbol of sacrifice. The man and the woman among the animal symbols are very interesting. The woman in the far right corner of the rainbow is holding a globe (most likely, a moon). There are many symbols of the divine feminine archetype but one of the most familiar in art is the Lunar Goddess. She is symbolic of the regenerative, life giving forces of Creation. In western culture, we refer to her as “mother nature”. She is the keeper of wisdom and power, and the spirit of both Earth and the Heavens. The Lunar Goddess represents the light within darkness and enlightenment from ignorance. She is also a symbol of regeneration / rebirth (i.e. ressurection). Notice how she is placed closest to the lion in the arch, as the lion is also a symbol of the divine male. Thank you Mormon Soprano for all your added insight! It is fantastic! I’ve also noted in similar pieces the use of the rainbow as a symbol for the veil, which would make sense in this case since man is separated by God at the top by the rainbow. So the figures depicted on the rainbow might be representative of the figures that were embroidered on the veil, i.e. cherubims (See Ex. 26:31; Ex. 36:35; 2 Chr. 3:14). The rainbow might also be symbolic of the covenant. I wholeheartedly agree with the rainbow/veil/covenant symbolism! Paul Durrieu (1855-1925) is considered the Leading Historian of Medieval Art. In 1888 he was appointed assistant keeper at the Louvre where he was responsible for early French painting and book illumination. He began researching illuminated manuscripts, in which field he became a specialist and expert. He was author to numerous publications, books and essays. He himself was a collector of fifteenth-century manuscripts, early painting, and French tapestries. 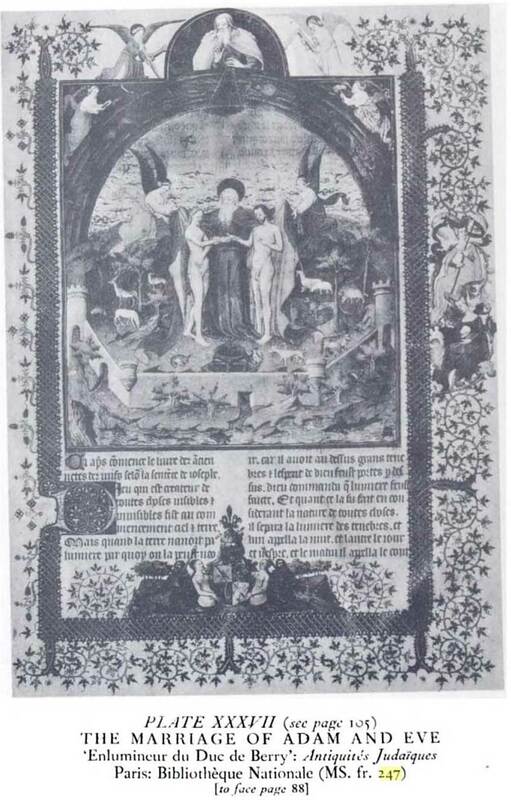 One of his essays is entitled: “Le temple de Jérusalem dans l’art français et flamand du XVe siècle” (The Temple of Jerusalem in French and Flemish Art of the 15th Century”). I am working on translating the entire essay. However, of interest is that Fouquet always used a Mideaval castle to represent the ancient temple. Thus, from my initial study we can safely conclude that the castle surrounding the garden is meant to represent the ancient temple of Jerusalem. This serves as a symbol of the sacred nature of the ceremony taking place within the walls of the temple – and also this creates a beautiful image of the Garden of Eden being not only a Holy Space, and very literally the First Temple of God on earth. As a side note, referencing my previous post, you will notice that the ocean completely surrounds the outside of the garden temple. The symbol of the ocean is life and knowledge (per Marc Jones above): “the sea is eternally the great supporting body of all experience.” Thus, in order to gain any experience, Adam and Eve must leave the safety of the garden temple, and venture out into the uncharted waters of life. I’ve added a few more examples from the same time period to the main post above. Apparently this iconography was somewhat popular in medieval France. I wonder what other examples are out there. Very cool! Too bad I cannot make out the inscription. (combo of my old eyes and Fouquet’s old Latin) However isn’t it amazing the intricacies of the entire page? The details and precision are just incredible! Everything was done painstakingly by hand – it is a complete masterpiece. I love the queen with her lady in waiting holding an infant sitting in the margin watching over the proceedings. Very interesting detail. Wow…this picture truly could be studied for hours. I believe that we all need to pass through three veils of water in this life (birth, baptism, death and resurrection). This picture simply gives me more added insight into that thought process. Perhaps the symbol of the rainbow in correlation with the veil is that of the process of the “Son” reflecting through the water? De-lurking to comment on one of my favorite works of art: I did much of my Masters (Art History) and PhD (Traditional Arts) research on symbols of the sacred in art, with a particular emphasis on the use of sacred geometry in art and architecture. I encountered and studied this illumination, but ran out of time to include it in my dissertation. It is important to note that the figures arcing through the sky are not a random collection of symbols. They are the signs of the zodiac, of which we can only see the six spring and summer months (reading from left to right): Aries, Taurus, Gemini, Cancer, Leo and Virgo. The signs of the zodiac are richly laden with their own symbolism, and this span of it was undoubtedly carefully chosen by the artist. If you look closely, you can see that Gemini is represented by 2 figures, not one. And although Cancer is identified as “the crab,” medieval artists throughout both the Christian and Islamic worlds felt free to substitute another crustacean to represent the astrological sign. While each of the zodiac signs can be interpreted in such a way that it points to Christ, perhaps this particular six month range was chosen because Aries, the Ram, is associated with the Easter season, and Virgo, the Virgin was associated with Mary. More importantly, it is only appropriate to show the birth of the world and the first marriage under the governance of the spring and summer seasons. (To instead show the signs of harvest, death, and dormancy would be obviously wrong here.) There are uncountable works of art contemporary with this one that rely on the symbols of the Zodiac to carry another level of meaning to the viewer. I recommend turning to medieval sources for clues to the interpretation of this particular illumination to avoid reading things into it. Writings by theologians associated with School of Chartres, for example, would be a good place to start looking at era-appropriate (and geographically likely) influences on the theology and cosmology that inspired this beautiful illumination. I do love the inclusion of Mary and the infant Christ in the margin, especially as it sets up an elegant parallel of the enclosed garden of Eden with Mary, thus foreshadowing the coming of the Savior. I am going to have to go back to my research to see if I have a color reproduction of the whole page! Very interesting, thank you everyone for your insight! 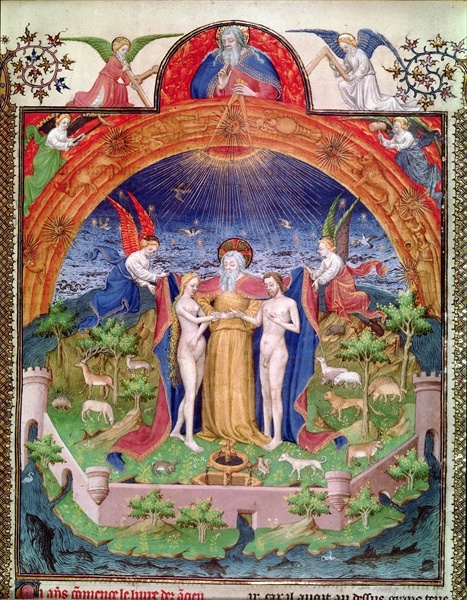 In the Fouquet illumination, with my modern, LDS eye I see a division of sacred space and a model of our life’s journey. -Perhaps the fish in sea represent Leviathan (Isaiah 27:1) … the forces of Chaos/Satan, who are allowed to come up from their depths to bite or tempt the children of Adam now swimming in the sea. -The current fallen state of the world as a telestial realm is represented by the sea. While in sea we must have faith and hope in Christ to anchor us (Ether 12:4; James 1:6), and we must righteously direct our life as with a helm “in the time of a storm” (D&C 123:16). -The Garden of Eden as a terrestrial realm is represented by the land and is protected from defilement by the castle wall. -The Holy of Holies is represented by God in heaven. It is brought to earth by God himself to the midst/middle of the Garden. His robe acts as a veil to define the boundary of the most holy space. In such an intimate setting, exact obedience is required; there is no room to hide one’s sins or pride! Adam and Eve are literally encircled about by God’s robe of righteousness in unity and at-one-ness (2 Nephi 4:33). In this place and condition the marriage covenant is made such that it may be binding on earth and in heaven. This is the path of our return to the Father. Look at the angel in the top left corner with the green robe. Someone commented it looks like he’s roasting a hot dog. Could that be a scepter in his hand? I just read the article about the Ankh (part 3). It has an image called “was” that looks very similar to what that angel has in his hands. It stands for power, dominion, and the priesthood. Makes perfect sense to have it in this painting. Google Image: Creation of Eve. Note also how many hand & wrist grasping in these early to later Christian art works! Also, how that along side these are depictions of the pre-existence, that show the council in heaven, etc. God also weds Adam & Eve in these creation depictions too! Nuremberg Chronicles, creation of Eve. 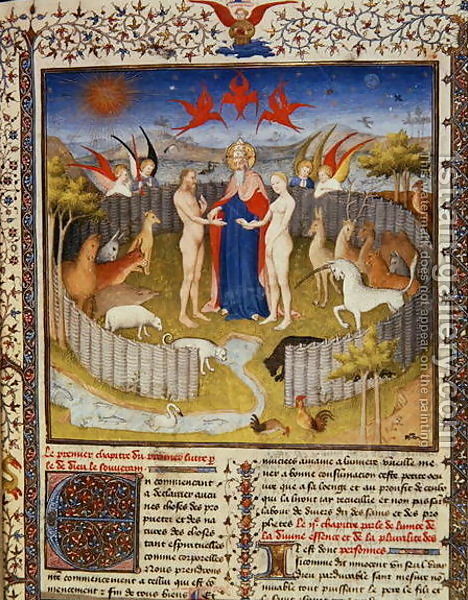 Book of Hours of Louis of Orleans , creation of Eve.